The Cardinals hosted their annual Boone Central duals Saturday in Albion, featuring several of the best mid-class teams in the state. Wood River is currently ranked #1 in Class C and has three wrestlers ranked atop their weight classes. Battle Creek is rated #2 in C with six wrestlers in the state top six rankings and Boys Town holds the #9 rating in Class B with five top-six competitors. “With this competition, we knew we would have our work cut out for us just to be somewhat competitive,” Bonge commented. “After the beating we took Thursday, I would say we learned from it. “This was a good meet for us. We faced a wide range of talent and competed better with each dual. “Although this group is a bit short right now in wrestling skills and experience, their enthusiasm, willingness to learn, competiveness and effort have been extraordinary. The Cardinals struggled in a 65-18 loss to Battle Creek in their opening dual of the day, but got pins by Bobby Stopak and Jon Christo. Boone Central then earned its initial dual victory of the season with a 44-36 decision over Norfolk Catholic in a topsy-turvy match-up. The Cards jumped out to a 27-6 lead which disappeared with two pins and two forfeit wins by Catholic. BC forged ahead again with a pin by Kody Sock and tech fall by Christo and, following a forfeit to the Knights, held a 38-36 edge with one match remaining. Jackson Meyer quickly collected a first-period pin at 103 to lock up the victory. Jacob Meyer and Mitch Patzel also had pins for BC and Skyler Weber scored a decision. Boone Central and Boys Town matched up poorly in weight classes and wrestled just five matches. Stopak scored a tough 3-2 win over Lino for BC’s only victory in a 50-27 defeat. 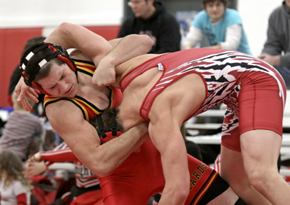 The Cardinals continued to compete hard against top-ranked Wood River, but fell by a team score of 65-16. Jacob Meyer notched a major decision and the Cards got pins by Christo and Zach Roberg. Boone Central saved its best for last and scored a 53-24 victory over Omaha Sourth in its final match-up of the day. The Cards won eight of the 10 matches contested, including pins by Stopak, Scott Joe, Jacob Meyer, Patzel, Cody Mangus and Sock.